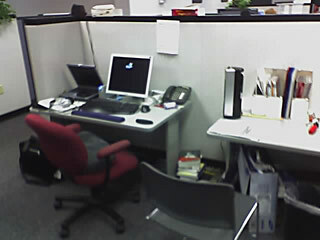 For those of you who are curious, this is what my (tiny) “office” space looks like. The funky looking thing on the right is actually a vertical, blower style, fan made by Holmes. Yes, that is indeed a 19″ Samsung LCD. Very sweet. Since I have very little desk space, I’ve started to invade the neighboring desks and even the divider (which doubles as a bookshelf!). I swear, we were told that this was temporary, like 3 months ago. Oh well. Note the extra fanny cushion…these are the worst desk chairs. EVAR. Actually, I’m somewhat disappointed in the quality of my cameraphone. Whodathunk that the camera sucked so much given the hefty price of the Razr?